Back in the 1930s, a small group of passionate local citizens saw the need to conserve our beautiful desert environment. One was Swedish botanist Gustaf Starck, who found like-minded residents by posting a sign, “Save the desert,” with an arrow pointing to his home. 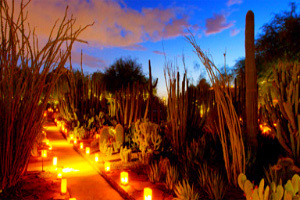 In 1936, they formed the Arizona Cactus and Native Flora Society (ACNFS) to sponsor a botanical garden to encourage an understanding, appreciation and promotion of the uniqueness of the world’s deserts, particularly our Sonoran Desert. Then Gertrude Webster, whose home was located in nearby Arcadia, joined the Society. She offered her encouragement, connections and financial support to establish the botanical garden in Papago Park.